Previously we mentioned about Hide Folders and Free 1 Second Folder Encrypt that can hide/safeguard your confidential data in Windows system, now there is another much simpler software utility that can achieve the same purpose. Named as My Lockbox, it is a freeware that can lock your personal folder and eventually make it invisible/inaccessible both locally and remotely even by system administrators. During installation stage, the utility will prompt users to setup a password that will be used to unlock any private data folder at a later stage. Once completed the setup and launch the utility, it will bring up a simple GUI that allows users to select specific folder to be locked. With only a single click of button, users can lock the folder and instantaneously the folder will be invisible from third party or even system administrators. In case users decide to unlock it, just press on ‘Unlock’ button and it will bring back the folder in normal condition. 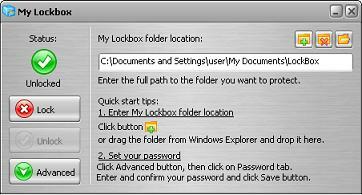 To simplify the usage, users can even configure hotkey to launch My Lockbox with simple keystroke, making it a more effective folder locking tool for all. If you think this is useful, just get a free download at My Lockbox for immediate use.